This article is about transportation. For the physical phenomenon, see Magnetic levitation. For other uses, see Maglev (disambiguation). Maglev (derived from magnetic levitation) is a system of train transportation that uses two sets of magnets, one set to repel and push the train up off the track, then another set to move the 'floating train' ahead at great speed taking advantage of the lack of friction. Along certain "medium range" routes (usually 200 to 400 miles (320 to 640 km)) Maglev can compete favorably with high-speed rail and airplanes. With Maglev technology, there are no moving parts. The train is the only moving part. The train travels along a guideway of magnets which control the train's stability and speed. Maglev trains are therefore quieter and smoother than conventional trains, and have the potential for much higher speeds. Maglev vehicles have set several speed records and Maglev trains can accelerate and decelerate much faster than conventional trains; the only practical limitation is the safety and comfort of the passengers. The power needed for levitation is typically not a large percentage of the overall energy consumption of a high speed maglev system. Overcoming drag, which makes all land transport more energy intensive at higher speeds, takes up the most energy. Vactrain technology has been proposed as a means to overcome this limitation. Maglev systems have been much more expensive to construct than conventional train systems, although the simpler construction of maglev vehicles makes them cheaper to manufacture and maintain. Despite over a century of research and development, maglev transport systems are in operation in just three countries (Japan, South Korea and China). The incremental benefits of maglev technology have often been hard to justify against cost and risk, especially where there is an existing or proposed conventional high speed train line with spare passenger carrying capacity, as in high-speed rail in Europe, the High Speed 2 in the UK and Shinkansen in Japan. In the late 1940s, the British electrical engineer Eric Laithwaite, a professor at Imperial College London, developed the first full-size working model of the linear induction motor. He became professor of heavy electrical engineering at Imperial College in 1964, where he continued his successful development of the linear motor. Since linear motors do not require physical contact between the vehicle and guideway, they became a common fixture on advanced transportation systems in the 1960s and 70s. Laithwaite joined one such project, the Tracked Hovercraft, although the project was cancelled in 1973. The linear motor was naturally suited to use with maglev systems as well. In the early 1970s, Laithwaite discovered a new arrangement of magnets, the magnetic river, that allowed a single linear motor to produce both lift and forward thrust, allowing a maglev system to be built with a single set of magnets. Working at the British Rail Research Division in Derby, along with teams at several civil engineering firms, the "transverse-flux" system was developed into a working system. The first commercial maglev people mover was simply called "MAGLEV" and officially opened in 1984 near Birmingham, England. It operated on an elevated 600 m (2,000 ft) section of monorail track between Birmingham Airport and Birmingham International railway station, running at speeds up to 42 km/h (26 mph). The system was closed in 1995 due to reliability problems. High-speed transportation patents were granted to various inventors throughout the world. Early United States patents for a linear motor propelled train were awarded to German inventor Alfred Zehden. The inventor was awarded U.S. Patent 782,312 (14 February 1905) and U.S. Patent RE12,700 (21 August 1907). [note 1] In 1907, another early electromagnetic transportation system was developed by F. S. Smith. A series of German patents for magnetic levitation trains propelled by linear motors were awarded to Hermann Kemper between 1937 and 1941. [note 2] An early maglev train was described in U.S. Patent 3,158,765, "Magnetic system of transportation", by G. R. Polgreen (25 August 1959). The first use of "maglev" in a United States patent was in "Magnetic levitation guidance system" by Canadian Patents and Development Limited. In 1959, while delayed in traffic on the Throgs Neck Bridge, James Powell, a researcher at Brookhaven National Laboratory (BNL), thought of using magnetically levitated transportation. Powell and BNL colleague Gordon Danby worked out a MagLev concept using static magnets mounted on a moving vehicle to induce electrodynamic lifting and stabilizing forces in specially shaped loops, such as figure of 8 coils on a guideway. These were patented in 1968-1969. Transrapid 05 was the first maglev train with longstator propulsion licensed for passenger transportation. In 1979, a 908 m (2,979 ft) track was opened in Hamburg for the first International Transportation Exhibition (IVA 79). Interest was sufficient that operations were extended three months after the exhibition finished, having carried more than 50,000 passengers. It was reassembled in Kassel in 1980. In 1979, in the USSR, in the town of Ramenskoye (Moscow oblast) was built an experimental test site for running experiments with cars on magnetic suspension. The test site consisted of a 600-meter ramp which was later extended to 980 meters. From the late 1970s to the 1980s five prototypes of cars were built that received designations from TP-01 (ТП-01) to TP-05 (ТП-05). The early cars were supposed to reach the speed up to 100 km/h. The construction of a maglev track using the technology from Ramenskoye started in Armenian SSR in 1987 and was planned to be completed in 1991. The track was supposed to connect the cities of Yerevan and Sevan via the city of Abovyan. The original design speed was 250 km/h which was later lowered to 180 km/h. However, the Spitak earthquake in 1988 and the Nagorno-Karabakh war caused the project to freeze. In the end the overpass was only partially constructed. In the early 1990s, the maglev theme was continued by the Engineering Research Center "TEMP" (ИНЦ "ТЭМП") this time by the order from the Moscow government. The project was named V250 (В250). The idea was to build a high-speed maglev train to connect Moscow to the Sheremetyevo airport. The train would consist of 64-seater cars and can run at the speeds up to 250 km/h. In 1993, due to the financial crisis, the project was abandoned. However, from 1999 the "TEMP" research center had been participating as a co-developer in the creation of the linear motors for the Moscow monorail system. The world's first commercial maglev system was a low-speed maglev shuttle that ran between the airport terminal of Birmingham International Airport and the nearby Birmingham International railway station between 1984 and 1995. Its track length was 600 m (2,000 ft), and trains levitated at an altitude of 15 mm (0.59 in), levitated by electromagnets, and propelled with linear induction motors. It operated for 11 years and was initially very popular with passengers, but obsolescence problems with the electronic systems made it progressively unreliable as years passed, leading to its closure in 1995. One of the original cars is now on display at Railworld in Peterborough, together with the RTV31 hover train vehicle. Another is on display at the National Railway Museum in York. The British Rail Research vehicle was 3 tonnes and extension to the 8 tonne vehicle was easy. The airport and rail buildings were suitable for terminal platforms. Only one crossing over a public road was required and no steep gradients were involved. Land was owned by the railway or airport. Local industries and councils were supportive. Some government finance was provided and because of sharing work, the cost per organization was low. After the system closed in 1995, the original guideway lay dormant until 2003, when a replacement cable-hauled system, the AirRail Link Cable Liner people mover, was opened. Transrapid, a German maglev company, had a test track in Emsland with a total length of 31.5 km (19.6 mi). The single-track line ran between Dörpen and Lathen with turning loops at each end. The trains regularly ran at up to 420 km/h (260 mph). Paying passengers were carried as part of the testing process. The construction of the test facility began in 1980 and finished in 1984. In 2006, the Lathen maglev train accident occurred killing 23 people, found to have been caused by human error in implementing safety checks. From 2006 no passengers were carried. At the end of 2011 the operation licence expired and was not renewed, and in early 2012 demolition permission was given for its facilities, including the track and factory. JNR ML500 at a test track in Miyazaki, Japan, on 21 December 1979 travelled at 517 km/h (321 mph), authorized by Guinness World Records. Japan operates two independently developed maglev trains. One is HSST (and its descendant, the Linimo line) by Japan Airlines and the other, which is more well-known, is SCMaglev by the Central Japan Railway Company. The development of the latter started in 1969. Miyazaki test track regularly hit 517 km/h (321 mph) by 1979. After an accident that destroyed the train, a new design was selected. In Okazaki, Japan (1987), the SCMaglev took a test ride at the Okazaki exhibition. Tests through the 1980s continued in Miyazaki before transferring to a far larger test track, 20 km (12 mi) long, in Yamanashi in 1997. Development of HSST started in 1974. In Tsukuba, Japan (1985), the HSST-03 (Linimo) became popular in spite of its 30 km/h (19 mph) at the Tsukuba World Exposition. In Saitama, Japan (1988), the HSST-04-1 was revealed at the Saitama exhibition performed in Kumagaya. Its fastest recorded speed was 300 km/h (190 mph). A new high speed maglev line, the Chuo Shinkansen, is planned to become operational in 2027, with construction starting 2017. In Vancouver, Canada, the HSST-03 by HSST Development Corporation (Japan Airlines and Sumitomo Corporation) was exhibited at Expo 86 and ran on a 400-metre (0.25 mi) test track that provided guests with a ride in a single car along a short section of track at the fairgrounds. It was removed after the fair and debut at the Aoi Expo in 1987 and now on static display at Okazaki Minami Park. In Hamburg, Germany, the TR-07 was exhibited at the international traffic exhibition (IVA88) in 1988. In West Berlin, the M-Bahn was built in the late 1980s. It was a driverless maglev system with a 1.6 km (0.99 mi) track connecting three stations. Testing with passenger traffic started in August 1989, and regular operation started in July 1991. Although the line largely followed a new elevated alignment, it terminated at Gleisdreieck U-Bahn station, where it took over an unused platform for a line that formerly ran to East Berlin. After the fall of the Berlin Wall, plans were set in motion to reconnect this line (today's U2). Deconstruction of the M-Bahn line began only two months after regular service began. It was called the Pundai project and was teminated in February 1992 due to safety concerns. South Korea's Incheon Airport Maglev, the world's fourth commercially operating maglev. In 1993, South Korea completed the development of its own maglev train, shown off at the Taejŏn Expo '93, which was developed further into a full-fledged maglev capable of travelling up to 110 km/h (68 mph) in 2006. This final model was incorporated in the Incheon Airport Maglev which opened on February 3, 2016, making South Korea the world's fourth country to operate its own self-developed maglev after the United Kingdom's Birmingham International Airport, Germany's Berlin M-Bahn, and Japan's Linimo. It links Incheon International Airport to the Yongyu Station and Leisure Complex on Yeongjong island. It offers a transfer to the Seoul Metropolitan Subway at AREX's Incheon International Airport Station and is offered free of charge to anyone to ride, operating between 9 am and 6 pm with 15 minute intervals. The maglev system was co-developed by the South Korea Institute of Machinery and Materials (KIMM) and Hyundai Rotem. It is 6.1 kilometres (3.8 mi) long, with six stations and a 110 km/h (68 mph) operating speed. Two more stages are planned of 9.7 km (6.0 mi) and 37.4 km (23.2 mi). Once completed it will become a circular line. Electromagnetic suspension (EMS), electronically controlled electromagnets in the train attract it to a magnetically conductive (usually steel) track. Electrodynamic suspension (EDS) uses superconducting electromagnets or strong permanent magnets that create a magnetic field, which induces currents in nearby metallic conductors when there is relative movement, which pushes and pulls the train towards the designed levitation position on the guide way. Another technology, which was designed, proven mathematically, peer-reviewed, and patented, but is, as of May 2015, unbuilt, is magnetodynamic suspension (MDS). It uses the attractive magnetic force of a permanent magnet array near a steel track to lift the train and hold it in place. Other technologies such as repulsive permanent magnets and superconducting magnets have seen some research. In electromagnetic suspension (EMS) systems, the train levitates above a steel rail while electromagnets, attached to the train, are oriented toward the rail from below. The system is typically arranged on a series of C-shaped arms, with the upper portion of the arm attached to the vehicle, and the lower inside edge containing the magnets. The rail is situated inside the C, between the upper and lower edges. Magnetic attraction varies inversely with the cube of distance, so minor changes in distance between the magnets and the rail produce greatly varying forces. These changes in force are dynamically unstable – a slight divergence from the optimum position tends to grow, requiring sophisticated feedback systems to maintain a constant distance from the track, (approximately 15 mm (0.59 in)). The major advantage to suspended maglev systems is that they work at all speeds, unlike electrodynamic systems, which only work at a minimum speed of about 30 km/h (19 mph). This eliminates the need for a separate low-speed suspension system, and can simplify track layout. On the downside, the dynamic instability demands fine track tolerances, which can offset this advantage. Eric Laithwaite was concerned that to meet required tolerances, the gap between magnets and rail would have to be increased to the point where the magnets would be unreasonably large. In practice, this problem was addressed through improved feedback systems, which support the required tolerances. The Japanese SCMaglev's EDS suspension is powered by the magnetic fields induced either side of the vehicle by the passage of the vehicle's superconducting magnets. In electrodynamic suspension (EDS), both the guideway and the train exert a magnetic field, and the train is levitated by the repulsive and attractive force between these magnetic fields. In some configurations, the train can be levitated only by repulsive force. In the early stages of maglev development at the Miyazaki test track, a purely repulsive system was used instead of the later repulsive and attractive EDS system. The magnetic field is produced either by superconducting magnets (as in JR–Maglev) or by an array of permanent magnets (as in Inductrack). The repulsive and attractive force in the track is created by an induced magnetic field in wires or other conducting strips in the track. A major advantage of EDS maglev systems is that they are dynamically stable – changes in distance between the track and the magnets creates strong forces to return the system to its original position. In addition, the attractive force varies in the opposite manner, providing the same adjustment effects. No active feedback control is needed. However, at slow speeds, the current induced in these coils and the resultant magnetic flux is not large enough to levitate the train. For this reason, the train must have wheels or some other form of landing gear to support the train until it reaches take-off speed. Since a train may stop at any location, due to equipment problems for instance, the entire track must be able to support both low- and high-speed operation. Another downside is that the EDS system naturally creates a field in the track in front and to the rear of the lift magnets, which acts against the magnets and creates magnetic drag. This is generally only a concern at low speeds, and is one of the reasons why JR abandoned a purely repulsive system and adopted the sidewall levitation system. At higher speeds other modes of drag dominate. The drag force can be used to the electrodynamic system's advantage, however, as it creates a varying force in the rails that can be used as a reactionary system to drive the train, without the need for a separate reaction plate, as in most linear motor systems. Laithwaite led development of such "traverse-flux" systems at his Imperial College laboratory. Alternatively, propulsion coils on the guideway are used to exert a force on the magnets in the train and make the train move forward. The propulsion coils that exert a force on the train are effectively a linear motor: an alternating current through the coils generates a continuously varying magnetic field that moves forward along the track. The frequency of the alternating current is synchronized to match the speed of the train. The offset between the field exerted by magnets on the train and the applied field creates a force moving the train forward. The term "maglev" refers not only to the vehicles, but to the railway system as well, specifically designed for magnetic levitation and propulsion. All operational implementations of maglev technology make minimal use of wheeled train technology and are not compatible with conventional rail tracks. Because they cannot share existing infrastructure, maglev systems must be designed as standalone systems. The SPM maglev system is inter-operable with steel rail tracks and would permit maglev vehicles and conventional trains to operate on the same tracks. MAN in Germany also designed a maglev system that worked with conventional rails, but it was never fully developed. Each implementation of the magnetic levitation principle for train-type travel involves advantages and disadvantages. EMS (Electromagnetic suspension) Magnetic fields inside and outside the vehicle are less than EDS; proven, commercially available technology; high speeds (500 km/h or 310 mph); no wheels or secondary propulsion system needed. The separation between the vehicle and the guideway must be constantly monitored and corrected due to the unstable nature of electromagnetic attraction; the system's inherent instability and the required constant corrections by outside systems may induce vibration. (Electrodynamic suspension) Onboard magnets and large margin between rail and train enable highest recorded speeds (603 km/h or 375 mph) and heavy load capacity; demonstrated successful operations using high-temperature superconductors in its onboard magnets, cooled with inexpensive liquid nitrogen. Strong magnetic fields on the train would make the train unsafe for passengers with pacemakers or magnetic data storage media such as hard drives and credit cards, necessitating the use of magnetic shielding; limitations on guideway inductivity limit maximum speed; vehicle must be wheeled for travel at low speeds. Inductrack System (Permanent Magnet Passive Suspension) Failsafe Suspension—no power required to activate magnets; Magnetic field is localized below the car; can generate enough force at low speeds (around 5 km/h or 3.1 mph) for levitation; given power failure cars stop safely; Halbach arrays of permanent magnets may prove more cost-effective than electromagnets. Requires either wheels or track segments that move for when the vehicle is stopped. Under development (as of 2008); No commercial version or full scale prototype. Neither Inductrack nor the Superconducting EDS are able to levitate vehicles at a standstill, although Inductrack provides levitation at much lower speed; wheels are required for these systems. EMS systems are wheel-free. The German Transrapid, Japanese HSST (Linimo), and Korean Rotem EMS maglevs levitate at a standstill, with electricity extracted from guideway using power rails for the latter two, and wirelessly for Transrapid. If guideway power is lost on the move, the Transrapid is still able to generate levitation down to 10 km/h (6.2 mph) speed, using the power from onboard batteries. This is not the case with the HSST and Rotem systems. EMS systems such as HSST/Linimo can provide both levitation and propulsion using an onboard linear motor. But EDS systems and some EMS systems such as Transrapid levitate but do not propel. Such systems need some other technology for propulsion. A linear motor (propulsion coils) mounted in the track is one solution. Over long distances coil costs could be prohibitive. Earnshaw's theorem shows that no combination of static magnets can be in a stable equilibrium. Therefore a dynamic (time varying) magnetic field is required to achieve stabilization. EMS systems rely on active electronic stabilization that constantly measures the bearing distance and adjusts the electromagnet current accordingly. EDS systems rely on changing magnetic fields to create currents, which can give passive stability. Because maglev vehicles essentially fly, stabilisation of pitch, roll and yaw is required. In addition to rotation, surge (forward and backward motions), sway (sideways motion) or heave (up and down motions) can be problematic. Superconducting magnets on a train above a track made out of a permanent magnet lock the train into its lateral position. It can move linearly along the track, but not off the track. This is due to the Meissner effect and flux pinning. Some systems use Null Current systems (also sometimes called Null Flux systems). These use a coil that is wound so that it enters two opposing, alternating fields, so that the average flux in the loop is zero. When the vehicle is in the straight ahead position, no current flows, but any moves off-line create flux that generates a field that naturally pushes/pulls it back into line. Some systems (notably the Swissmetro system) propose the use of vactrains—maglev train technology used in evacuated (airless) tubes, which removes air drag. This has the potential to increase speed and efficiency greatly, as most of the energy for conventional maglev trains is lost to aerodynamic drag. One potential risk for passengers of trains operating in evacuated tubes is that they could be exposed to the risk of cabin depressurization unless tunnel safety monitoring systems can repressurize the tube in the event of a train malfunction or accident though since trains are likely to operate at or near the Earth's surface, emergency restoration of ambient pressure should be straightforward. The RAND Corporation has depicted a vacuum tube train that could, in theory, cross the Atlantic or the USA in ~21 minutes. Energy for maglev trains is used to accelerate the train. Energy may be regained when the train slows down via regenerative braking. It also levitates and stabilises the train's movement. Most of the energy is needed to overcome air drag. Some energy is used for air conditioning, heating, lighting and other miscellany. At low speeds the percentage of power used for levitation can be significant, consuming up to 15% more power than a subway or light rail service. For short distances the energy used for acceleration might be considerable. The power used to overcome air drag increases with the cube of the velocity and hence dominates at high speed. The energy needed per unit distance increases by the square of the velocity and the time decreases linearly. For example, 2.5 times as much power is needed to travel at 400 km/h (250 mph) than 300 km/h (190 mph). Aircraft take advantage of lower air pressure and lower temperatures by cruising at altitude to reduce energy consumption but unlike trains need to carry fuel on board. This has led to the suggestion of conveying maglev vehicles through partially evacuated tubes or tunnels with the possibility of supplying energy from renewable sources. Maglev transport is non-contact and electric powered. It relies less or not at all on the wheels, bearings and axles common to wheeled rail systems. Speed: Maglev allows higher top speeds than conventional rail, but experimental wheel-based high-speed trains have demonstrated similar speeds. Maintenance: Maglev trains currently in operation have demonstrated the need for minimal guideway maintenance. Vehicle maintenance is also minimal (based on hours of operation, rather than on speed or distance traveled). Traditional rail is subject to mechanical wear and tear that increases rapidly with speed, also increasing maintenance. For example: the wearing down of brakes and overhead wire wear have caused problems for the Fastech 360 rail Shinkansen. Maglev would eliminate these issues. Weather: Maglev trains are little affected by snow, ice, severe cold, rain or high winds. However, they have not operated in the wide range of conditions that traditional friction-based rail systems have operated. Maglev vehicles accelerate and decelerate faster than mechanical systems regardless of the slickness of the guideway or the slope of the grade because they are non-contact systems. Track: Maglev trains are not compatible with conventional track, and therefore require custom infrastructure for their entire route. By contrast conventional high-speed trains such as the TGV are able to run, albeit at reduced speeds, on existing rail infrastructure, thus reducing expenditure where new infrastructure would be particularly expensive (such as the final approaches to city terminals), or on extensions where traffic does not justify new infrastructure. John Harding, former chief maglev scientist at the Federal Railroad Administration, claimed that separate maglev infrastructure more than pays for itself with higher levels of all-weather operational availability and nominal maintenance costs. These claims have yet to be proven in an intense operational setting and they do not consider the increased maglev construction costs. Efficiency: Conventional rail is probably more efficient at lower speeds. But due to the lack of physical contact between the track and the vehicle, maglev trains experience no rolling resistance, leaving only air resistance and electromagnetic drag, potentially improving power efficiency. Some systems however such as the Central Japan Railway Company SCMaglev use rubber tires at low speeds, reducing efficiency gains. Weight: The electromagnets in many EMS and EDS designs require between 1 and 2 kilowatts per ton. The use of superconductor magnets can reduce the electromagnets' energy consumption. A 50-ton Transrapid maglev vehicle can lift an additional 20 tons, for a total of 70 tons, which consumes 70–140 kW (94–188 hp). Most energy use for the TRI is for propulsion and overcoming air resistance at speeds over 100 mph (160 km/h). Weight loading: High speed rail requires more support and construction for its concentrated wheel loading. Maglev cars are lighter and distribute weight more evenly. Noise: Because the major source of noise of a maglev train comes from displaced air rather than from wheels touching rails, maglev trains produce less noise than a conventional train at equivalent speeds. However, the psychoacoustic profile of the maglev may reduce this benefit: a study concluded that maglev noise should be rated like road traffic, while conventional trains experience a 5–10 dB "bonus", as they are found less annoying at the same loudness level. Magnet reliability: Superconducting magnets are generally used to generate the powerful magnetic fields to levitate and propel the trains. These magnets must be kept below their critical temperatures (this ranges from 4.2 K to 77 K, depending on the material). New alloys and manufacturing techniques in superconductors and cooling systems have helped address this issue. Control systems: No signalling systems are needed for high-speed rail, because such systems are computer controlled. Human operators cannot react fast enough to manage high-speed trains. High speed systems require dedicated rights of way and are usually elevated. Two maglev system microwave towers are in constant contact with trains. There is no need for train whistles or horns, either. Terrain: Maglevs are able to ascend higher grades, offering more routing flexibility and reduced tunneling. However, their high speed and greater need for control make it difficult for a maglev to merge with complex terrain, such as a curved hill. Traditional trains, on the other hand, are able to curve along side a mountain top or meander through a forest. Efficiency: For maglev systems the lift-to-drag ratio can exceed that of aircraft (for example Inductrack can approach 200:1 at high speed, far higher than any aircraft). This can make maglev more efficient per kilometer. However, at high cruising speeds, aerodynamic drag is much larger than lift-induced drag. Jets take advantage of low air density at high altitudes to significantly reduce air drag. Hence despite their lift-to-drag ratio disadvantage, they can travel more efficiently at high speeds than maglev trains that operate at sea level. Routing: Maglevs offer competitive journey times for distances of 800 km (500 mi) or less. Additionally, maglevs can easily serve intermediate destinations. Availability: Maglevs are little affected by weather. Travel time: Maglevs do not face the extended security protocols faced by air travelers nor is time consumed for taxiing, or for queuing for take-off and landing. The South Shanghai extension was expected to cost approximately US$18 million per kilometre. In 2006 the German government invested $125 million in guideway cost reduction development that produced an all-concrete modular design that is faster to build and is 30% less costly. Other new construction techniques were also developed that put maglev at or below price parity with new high-speed rail construction. The United States Federal Railroad Administration, in a 2005 report to Congress, estimated cost per mile of between US$50 million and US$100 million. The Maryland Transit Administration (MTA) Environmental Impact Statement estimated a pricetag at US$4.9 billion for construction, and $53 million a year for operations of its project. The Japanese Linimo HSST, cost approximately US$100 million/km to build. Besides offering improved operation and maintenance costs over other transit systems, these low-speed maglevs provide ultra-high levels of operational reliability and introduce little noise[verification needed] and generate zero air pollution into dense urban settings. As more maglev systems are deployed, experts expected construction costs to drop by employing new construction methods and from economies of scale. The highest recorded maglev speed is 603 km/h (375 mph), achieved in Japan by JR Central's L0 superconducting Maglev on 21 April 2015, 28 km/h (17 mph) faster than the conventional TGV wheel-rail speed record. However, the operational and performance differences between these two very different technologies is far greater. The TGV record was achieved accelerating down a 72.4 km (45.0 mi) slight decline, requiring 13 minutes. It then took another 77.25 km (48.00 mi) for the TGV to stop, requiring a total distance of 149.65 km (92.99 mi) for the test. The MLX01 record, however, was achieved on the 18.4 km (11.4 mi) Yamanashi test track – 1/8 the distance. No maglev or wheel-rail commercial operation has actually been attempted at speeds over 500 km/h (310 mph). 1979-12-12 Japan ML-500R 504 km/h (313 mph) (unmanned) It succeeds in operation over 500 km/h for the first time in the world. 1999 Japan MLX01 552 km/h (343 mph) (manned/five-car formation). Guinness authorization. 2003 Japan MLX01 581 km/h (361 mph) (manned/three formation). Guinness authorization. General Atomics has a 120 m (390 ft) test facility in San Diego, that is used to test Union Pacific's 8 km (5.0 mi) freight shuttle in Los Angeles. The technology is "passive" (or "permanent"), using permanent magnets in a Halbach array for lift and requiring no electromagnets for either levitation or propulsion. General Atomics received US$90 million in research funding from the federal government. They are also considering their technology for high-speed passenger services. Japan has a demonstration line in Yamanashi prefecture where test train SCMaglev L0 Series Shinkansen reached 603 km/h (375 mph), faster than any wheeled trains. These trains use superconducting magnets, which allow for a larger gap, and repulsive/attractive-type electrodynamic suspension (EDS). In comparison Transrapid uses conventional electromagnets and attractive-type electromagnetic suspension (EMS). On 15 November 2014, The Central Japan Railway Company ran eight days of testing for the experimental maglev Shinkansen train on its test track in Yamanashi Prefecture. One hundred passengers covered a 42.8 km (26.6 mi) route between the cities of Uenohara and Fuefuki, reaching speeds of up to 500 km/h (310 mph). In the US, the Federal Transit Administration (FTA) Urban Maglev Technology Demonstration program funded the design of several low-speed urban maglev demonstration projects. It assessed HSST for the Maryland Department of Transportation and maglev technology for the Colorado Department of Transportation. The FTA also funded work by General Atomics at California University of Pennsylvania to evaluate the MagneMotion M3 and of the Maglev2000 of Florida superconducting EDS system. Other US urban maglev demonstration projects of note are the LEVX in Washington State and the Massachusetts-based Magplane. On 31 December 2000, the first crewed high-temperature superconducting maglev was tested successfully at Southwest Jiaotong University, Chengdu, China. This system is based on the principle that bulk high-temperature superconductors can be levitated stably above or below a permanent magnet. The load was over 530 kg (1,170 lb) and the levitation gap over 20 mm (0.79 in). The system uses liquid nitrogen to cool the superconductor. Max Bögl, a german construction company has built a testtrack in Sengenthal, Bavaria, Germany. In appearance it´s more like the German M-Bahn than the Transrapid system. The vehicle tested on the track is patented in the US by Max Bögl. The Shanghai Maglev Train, also known as the Transrapid, has a top speed of 430 km/h (270 mph). The line was designed to connect Shanghai Pudong International Airport and the outskirts of central Pudong, Shanghai. It covers a distance of 30.5 km (19.0 mi) in 7 or 8 minutes. The Shanghai system was labeled a white elephant by rivals. In January 2001, the Chinese signed an agreement with Transrapid to build an EMS high-speed maglev line to link Pudong International Airport with Longyang Road Metro station on the southeastern edge of Shanghai. This Shanghai Maglev Train demonstration line, or Initial Operating Segment (IOS), has been in commercial operations since April 2004 and now operates 115 daily trips (up from 110 in 2010) that traverse the 30 km (19 mi) between the two stations in 7 or 8 minutes, achieving a top speed of 431 km/h (268 mph) and averaging 266 km/h (165 mph). On a 12 November 2003 system commissioning test run, it achieved 501 km/h (311 mph), its designed top cruising speed. The Shanghai maglev is faster than Birmingham technology and comes with on-time – to the second – reliability greater than 99.97%. Plans to extend the line to Shanghai South Railway Station and Hongqiao Airport on the northwestern edge of Shanghai are on hold. After the Shanghai–Hangzhou Passenger Railway became operational in late 2010, the maglev extension became somewhat redundant and may be cancelled. 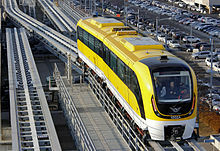 The commercial automated "Urban Maglev" system commenced operation in March 2005 in Aichi, Japan. The Tobu Kyuryo Line, otherwise known as the Linimo line, covers 9 km (5.6 mi). It has a minimum operating radius of 75 m (246 ft) and a maximum gradient of 6%. The linear-motor magnetically levitated train has a top speed of 100 km/h (62 mph). More than 10 million passengers used this "urban maglev" line in its first three months of operation. At 100 km/h (62 mph), it is sufficiently fast for frequent stops, has little or no noise impact on surrounding communities, can navigate short radius rights of way, and operates during inclement weather. The trains were designed by the Chubu HSST Development Corporation, which also operates a test track in Nagoya. The Incheon Airport Maglev began commercial operation on February 3, 2016. It was developed and built domestically. Compared to Linimo, it has a more futuristic design thanks to it being lighter with construction costs cut to half. It connects Incheon International Airport with Yongyu Station, cutting journey time. The first maglev test trials using electromagnetic suspension opened to public was HML-03, made by Hyundai Heavy Industries for the Daejeon Expo in 1993, after five years of research and manufacturing two prototypes, HML-01 and HML-02. Government research on urban maglev using electromagnetic suspension began in 1994. The first operating urban maglev was UTM-02 in Daejeon beginning on 21 April 2008 after 14 years of development and one prototype; UTM-01. The train runs on a 1 km (0.62 mi) track between Expo Park and National Science Museum which has been shortened with the redevelopment of Expo Park. The track currently ends at the street parallel to the science museum. Meanwhile UTM-02 conducted the world's first ever maglev simulation. However UTM-02 is still the second prototype of a final model. The final UTM model of Rotem's urban maglev, UTM-03, was scheduled to debut at the end of 2014 in Incheon's Yeongjong island where Incheon International Airport is located. The Hunan provincial government launched the construction of a maglev line between Changsha Huanghua International Airport and Changsha South Railway Station. Construction started in May 2014 and was completed by the end of 2015. Trial runs began on 26 December 2015 and trial operations started on 6 May 2016. As of 13 June 2018 the Changsha maglev covered distance of 1.7 million km and carried nearly 6 million passengers. The next generation of this vehicle is rolled off the production line and is capable of running at a top speed of 160 km/h. Beijing has built China's second low-speed maglev line, S1 Line, Beijing Subway, using technology developed by National University of Defense Technology. The line was opened on December 30, 2017. The line operates at speeds up to 100 km/h. A second prototype system in Powder Springs, Georgia, USA, was built by American Maglev Technology, Inc. The test track is 610 m (2,000 ft) long with a 168.6 m (553 ft) curve. Vehicles are operated up to 60 km/h (37 mph), below the proposed operational maximum of 97 km/h (60 mph). A June 2013 review of the technology called for an extensive testing program to be carried out to ensure the system complies with various regulatory requirements including the American Society of Civil Engineers (ASCE) People Mover Standard. The review noted that the test track is too short to assess the vehicles' dynamics at the maximum proposed speeds. Qingyuan Maglev (清远磁浮旅游专线) is a medium-low speed maglev line in Qingyuan, Guangdong province, China. The first phase is 8.1 km with 3 stations (and 1 more reserved station). Construction of Chuo Shinkansen began in 2014. It was expected to begin operations by 2027. The plan for the Chuo Shinkansen bullet train system was finalized based on the Law for Construction of Countrywide Shinkansen. The Linear Chuo Shinkansen Project aimed to operate the Superconductive Magnetically Levitated Train to connect Tokyo and Osaka by way of Nagoya, the capital city of Aichi, in approximately one hour at a speed of 500 km/h (310 mph). The full track between Tokyo and Osaka was to be completed in 2045. L0 Series train type undergoing testing by the Central Japan Railway Company (JR Central) for eventual use on the Chūō Shinkansen line set a world speed record of 603 km/h (375 mph) on 21 April 2015. The trains are planned to run at a maximum speed of 505 km/h (314 mph), offering journey times of 40 minutes between Tokyo (Shinagawa Station) and Nagoya, and 1 hour 7 minutes between Tokyo and Osaka. Skytran announced it would build an elevated network of sky cars in Tel Aviv, Israel. The technology was developed by NASA with the support of Israel Aerospace Industries. The system was meant to be suspended from an elevated track. The vehicles would travel at 70 km/h (43 mph) although the commercial rollout was expected to offer much faster vehicles. A trial of the system was to be built with a test track on the campus of Israel Aerospace Industries. Once successful, a full commercial version of SkyTran was expected to be rolled out first in Tel Aviv. The trial was scheduled to be up and running by the end of 2015. The company stated that speeds of up to 240 km/h (150 mph) are achievable. Many maglev systems have been proposed in North America, Asia and Europe. Many are in the early planning stages or were explicitly rejected. A maglev route was proposed between Sydney and Wollongong. The proposal came to prominence in the mid-1990s. The Sydney–Wollongong commuter corridor is the largest in Australia, with upwards of 20,000 people commuting each day. Current trains use the Illawarra line, between the cliff face of the Illawarra escarpment and the Pacific Ocean, with travel times about 2 hours. The proposal would cut travel times to 20 minutes. The proposed Melbourne maglev connecting the city of Geelong through Metropolitan Melbourne's outer suburban growth corridors, Tullamarine and Avalon domestic in and international terminals in under 20 min and on to Frankston, Victoria, in under 30 min. In late 2008, a proposal was put forward to the Government of Victoria to build a privately funded and operated maglev line to service the Greater Melbourne metropolitan area in response to the Eddington Transport Report that did not investigate above-ground transport options. The maglev would service a population of over 4 million and the proposal was costed at A$8 billion. However despite road congestion and Australia's highest roadspace per capita, the government dismissed the proposal in favour of road expansion including an A$8.5 billion road tunnel, $6 billion extension of the Eastlink to the Western Ring Road and a $700 million Frankston Bypass. A first proposal was formalized in April 2008, in Brescia, by journalist Andrew Spannaus who recommended a high speed connection between Malpensa airport to the cities of Milan, Bergamo and Brescia. In March 2011 Nicola Oliva proposed a maglev connection between Pisa airport and the cities of Prato and Florence (Santa Maria Novella train station and Florence Airport). The travelling time would be reduced from the typical 1 hour 15 minutes to around 20 minutes. The second part of the line would be a connection to Livorno, to integrate maritime, aerial and terrestrial transport systems. London – Glasgow: A line was proposed in the United Kingdom from London to Glasgow with several route options through the Midlands, Northwest and Northeast of England. It was reported to be under favourable consideration by the government. The approach was rejected in the Government White Paper Delivering a Sustainable Railway published on 24 July 2007. Another high-speed link was planned between Glasgow and Edinburgh but the technology remained unsettled. Union Pacific freight conveyor: Plans are under way by American rail road operator Union Pacific to build a 7.9 km (4.9 mi) container shuttle between the Ports of Los Angeles and Long Beach, with UP's intermodal container transfer facility. The system would be based on "passive" technology, especially well suited to freight transfer as no power is needed on board. The vehicle is a chassis that glides to its destination. The system is being designed by General Atomics. California-Nevada Interstate Maglev: High-speed maglev lines between major cities of southern California and Las Vegas are under study via the California-Nevada Interstate Maglev Project. This plan was originally proposed as part of an I-5 or I-15 expansion plan, but the federal government ruled that it must be separated from interstate public work projects. After the decision, private groups from Nevada proposed a line running from Las Vegas to Los Angeles with stops in Primm, Nevada; Baker, California; and other points throughout San Bernardino County into Los Angeles. Politicians expressed concern that a high-speed rail line out of state would carry spending out of state along with travelers. Baltimore – Washington D.C. Maglev: Baltimore-Washington Superconducting Maglev Project of 64 km (40 mi) has been proposed linking Camden Yards in Baltimore and Baltimore-Washington International (BWI) Airport to Union Station in Washington, D.C. The Pennsylvania Project: The Pennsylvania High-Speed Maglev Project corridor extends from the Pittsburgh International Airport to Greensburg, with intermediate stops in Downtown Pittsburgh and Monroeville. This initial project was claimed to serve approximately 2.4 million people in the Pittsburgh metropolitan area. The Baltimore proposal competed with the Pittsburgh proposal for a US$90 million federal grant. San Diego-Imperial County airport: In 2006 San Diego commissioned a study for a maglev line to a proposed airport located in Imperial County. SANDAG claimed that the concept would be an "airports [sic] without terminals", allowing passengers to check in at a terminal in San Diego ("satellite terminals"), take the train to the airport and directly board the airplane. In addition, the train would have the potential to carry freight. Further studies were requested although no funding was agreed. Orlando International Airport to Orange County Convention Center: In December 2012 the Florida Department of Transportation gave conditional approval to a proposal by American Maglev to build a privately run 14.9-mile (24.0 km), 5-station line from Orlando International Airport to Orange County Convention Center. The Department requested a technical assessment and said there would be a request for proposals issued to reveal any competing plans. The route requires the use of a public right of way. If the first phase succeeded American Maglev would propose two further phases (of 4.9 and 19.4 mi (7.9 and 31.2 km)) to carry the line to Walt Disney World. San Juan – Caguas: A 16.7 mi (26.9 km) maglev project was proposed linking Tren Urbano's Cupey Station in San Juan with two proposed stations in the city of Caguas, south of San Juan. The maglev line would run along Highway PR-52, connecting both cities. According to American Maglev project cost would be approximately US$380 million. Toronto Zoo: Edmonton-based Magnovate has proposed a new ride and transportation system at the Toronto Zoo reviving the Toronto Zoo Domain Ride system, which was closed following two severe accidents in 1994. The Zoo's board unanimously approved the proposal on November 29, 2018. The company will construct and operate the $25 million system on the former route of the Domain Ride (known locally as the Monorail, despite not being considered one) at zero cost to the Zoo and operate it for 15 years, splitting the profits with the Zoo. The ride will serve a single-directional loop around Zoo grounds, serving five stations and likely replacing the current Zoomobile tour tram service. Planned to be operational by 2022 at the earliest, this will become the first commercially operating maglev system in North America should it be approved. On 25 September 2007, Bavaria announced a high-speed maglev-rail service from Munich to its airport. The Bavarian government signed contracts with Deutsche Bahn and Transrapid with Siemens and ThyssenKrupp for the €1.85 billion project. On 27 March 2008, the German Transport minister announced the project had been cancelled due to rising costs associated with constructing the track. A new estimate put the project between €3.2–3.4 billion. SwissRapide: The SwissRapide AG together with the SwissRapide Consortium was planning and developing the first maglev monorail system for intercity traffic between the country's major cities. SwissRapide was to be financed by private investors. In the long-term, the SwissRapide Express was to connect the major cities north of the Alps between Geneva and St. Gallen, including Lucerne and Basel. The first projects were Bern – Zurich, Lausanne – Geneva as well as Zurich – Winterthur. The first line (Lausanne – Geneva or Zurich – Winterthur) could go into service as early as 2020. Swissmetro: An earlier project, Swissmetro AG envisioned a partially evacuated underground maglev (a vactrain). As with SwissRapide, Swissmetro envisioned connecting the major cities in Switzerland with one another. In 2011, Swissmetro AG was dissolved and the IPRs from the organisation were passed onto the EPFL in Lausanne. China planned to extend the existing Shanghai Maglev Train, initially by around 35 km (22 mi) to Shanghai Hongqiao Airport and then 200 km (120 mi) to the city of Hangzhou (Shanghai-Hangzhou Maglev Train). If built, this would be the first inter-city maglev rail line in commercial service. The project was controversial and repeatedly delayed. In May 2007 the project was suspended by officials, reportedly due to public concerns about radiation from the system. In January and February 2008 hundreds of residents demonstrated in downtown Shanghai that the line route came too close to their homes, citing concerns about sickness due to exposure to the strong magnetic field, noise, pollution and devaluation of property near to the lines. Final approval to build the line was granted on 18 August 2008. Originally scheduled to be ready by Expo 2010, plans called for completion by 2014. The Shanghai municipal government considered multiple options, including building the line underground to allay public fears. This same report stated that the final decision had to be approved by the National Development and Reform Commission. In 2007 the Shanghai municipal government was considering building a factory in Nanhui district to produce low-speed maglev trains for urban use. A proposed line would have connected Shanghai to Beijing, over a distance of 1,300 km (800 mi), at an estimated cost of £15.5bn. No projects had been revealed as of 2014. Low speed maglev (urban maglev) is proposed for YangMingShan MRT Line for Taipei, a circular line connecting Taipei City to New Taipei City, and almost all other Taipei transport routes, but especially the access starved northern suburbs of Tien Mou and YangMingShan. From these suburbs to the city, transit times would be reduced by 70% or more compared to peak hours, and between Tien Mou and YangMingShan, from approx 20 minutes, to 3 minutes. Key to the line is YangMingShan Station, at ‘Taipei level’ in the mountain, 200M below YangMingShan (YangMing Mountain) Village, with 40 second high speed elevators to the Village. Linimo or a similar system would be preferred, as being the core of Taipei's public transport system, it should run 24 hours a day. Also, in certain areas it would run within metres of apartments, so the near silent operation, and minimal maintenance requirements of maglev would be major advantages. An extension of the line could run to Chiang Kai Shek Airport, and possibly on down the island, passing through major population centres, which the High Speed Rail must avoid. The minimal vibration of maglev would also be suitable to provide access Hsinchu Science Park, where sensitive silicon foundries are located. In the other direction, connection to the Tansui Line and to High Speed ferries at Tansui would provide overnight travel to Shanghai and Nagasaki, and to Busan or Mokpo in South Korea, thus interconnecting the public transport systems of four countries, with great savings in fossil fuel consumption compared to flight. YangMingShan MRT Line won the 'Engineering Excellence' Award, at the 2013 World Metro Summit in Shanghai. The Express Rail Link, previously known as the Regional Express, connect Kowloon with the territory's border with China, explored different technologies and designs in its planning stage, between Maglev and conventional highspeed railway, and if the latter was chosen, between a dedicated new route and sharing the tracks with the existing West Rail. Finally conventional highspeed with dedicated new route was chosen. The final phase, which connects Shenzhen-Futian to Hong Kong (West Kowloon) was inaugurated on 22 September 2018. It opened for public on Sunday 23 September 2018. A project was presented to Indian railway minister (Mamata Banerjee) by an American company to connect Mumbai and Delhi. Then Prime Minister Manmohan Singh said that if the line project was successful the Indian government would build lines between other cities and also between Mumbai Central and Chhatrapati Shivaji International Airport. The State of Maharashtra approved a feasibility study for a maglev train between Mumbai and Nagpur, some 1,000 km (620 mi) apart. A detailed report was to be prepared and submitted by December 2012 for a line to connect Chennai to Mysore via Bangalore at a cost $26 million per kilometre, reaching speeds of 350 km/h. A Consortium led by UEM Group Bhd and ARA Group, proposed Maglev technology to link Malaysian cities to Singapore. The idea was first mooted by YTL Group. Its technology partner then was said to be Siemens. High costs sank the proposal. The concept of a high-speed rail link from Kuala Lumpur to Singapore resurfaced. It was cited as a proposed "high impact" project in the Economic Transformation Programme (ETP) that was unveiled in 2010. Approval has been given for the Kuala Lumpur-Singapore High Speed Rail project, but not using maglev technology. In May 2009, Iran and a German company signed an agreement to use maglev to link Tehran and Mashhad. The agreement was signed at the Mashhad International Fair site between Iranian Ministry of Roads and Transportation and the German company. The 900 km (560 mi) line possibly could reduce travel time between Tehran and Mashhad to about 2.5 hours. Munich-based Schlegel Consulting Engineers said they had signed the contract with the Iranian ministry of transport and the governor of Mashad. "We have been mandated to lead a German consortium in this project," a spokesman said. "We are in a preparatory phase." The project could be worth between 10 billion and 12 billion euros, the Schlegel spokesman said. Two incidents involved fires. A Japanese test train in Miyazaki, MLU002, was completely consumed in a fire in 1991. On 11 August 2006, a fire broke out on the commercial Shanghai Transrapid shortly after arriving at the Longyang terminal. People were evacuated without incident before the vehicle was moved about 1 kilometre to keep smoke from filling the station. NAMTI officials toured the SMT maintenance facility in November 2010 and learned that the cause of the fire was "thermal runaway" in a battery tray. As a result, SMT secured a new battery vendor, installed new temperature sensors and insulators and redesigned the trays. On 22 September 2006, a Transrapid train collided with a maintenance vehicle on a test/publicity run in Lathen (Lower Saxony / north-western Germany). Twenty-three people were killed and ten were injured; these were the first maglev crash fatalities. The accident was caused by human error. Charges were brought against three Transrapid employees after a year-long investigation. Safety becomes an ever greater concern with high speed public transport due to the potentially large impact force and number of casualties. In the case of maglev trains, an incident could result from human error, including loss of power, or factors outside human control, such as ground movement, for example, caused by an earthquake. ^ These German patents would be GR643316 (1937), GR44302 (1938), GR707032 (1941). ^ This is the case with the Moscow Monorail – currently the only non-maglev linear motor-propelled monorail train in active service. ^ This is typically the case with electrodynamic suspension maglev trains. Aerodynamic factors may also play a role in the levitation of such trains. Where that is the case, it might be argued that they are technically hybrid systems insofar as their levitation isn't purely magnetic – but their linear motors are electromagnetic systems, and these achieve the higher speeds at which the aerodynamic factors come into play. ^ K.C.Coates. "High-speed rail in the United Kingdom" (PDF). High-speed rail in the United Kingdom. Archived from the original (PDF) on 19 September 2011. Retrieved 13 December 2012. ^ Radford, Tim (11 October 1999). "Nasa takes up idea pioneered by Briton – Magnetic levitation technology was abandoned by government". The Guardian. London. ^ "Obituary for the late Professor Eric Laithwaite", Daily Telegraph, 6 December 1997. ^ "The magnetic attraction of trains". BBC News. 9 November 1999. Retrieved 28 November 2010. ^ U.S. Patent 3,736,880, 21 January 1972. Page 10 Column 1 Line 15 to Page 10 Column 2 Line 25. ^ U.S. Patent 859,018, 2 July 1907. ^ U.S. Patent 3,858,521; 26 March 1973. ^ Muller, Christopher (23 January 1997). "Magnetic Levitation for Transportation". railserve.com. ^ "Brookhaven Lab Retirees Win Benjamin Franklin Medal For Their Invention of Magnetically Levitated Trains". Brookhaven National Laboratory. 18 April 2000. ^ US3,470,828 Granted 17 October 1969. ^ "Юные красноярские железнодорожники разработали модель поезда на магнитной подушке". newslab.ru. Retrieved 15 October 2018. ^ "Как маглев до Еревана не "доехал". Армения могла стать первой в СССР республикой с магнитным монорельсом". Центр поддержки русско-армянских стратегических и общественных инициатив. 19 February 2017. Retrieved 15 October 2018. ^ "The magnetic attraction of trains". BBC News. 9 November 1999. ^ "New plan aims to bring the Maglev back". Birmingham Mail. Archived from the original on 22 May 2011. Retrieved 1 September 2006. ^ "AirRail Shuttle Birmingham International Airport". DCC Doppelmayr. Retrieved 16 July 2008. ^ "Birmingham International Airport People Mover". Arup. Archived from the original on 29 November 2007. Retrieved 11 July 2008. ^ Sanchanta, Mariko (26 January 2010). "High-Speed Rail Approaches Station". WSJ. ^ "Japanese Maglev System – HSST -History of Development". ^ "A Few Views of Expo 86 in Vancouver, BC". ^ Hamer, Mick (15 March 1984). "Birmingham maglev off to flying start". New Scientist. pp. 25–27. Retrieved 14 June 2016. ^ Sponseller, Michael (December 1988). "Magnetic train". Popular Science. pp. 97–98. Retrieved 14 June 2016. ^ "KBS WORLD". Retrieved 26 September 2010. ^ "Maglev Train to Debut at Incheon in 2012". Retrieved 26 September 2010. ^ "Magnetic levitation train to operate in July". Retrieved 3 October 2014. ^ "Railway Gazette: Airport maglev demonstration line". Retrieved 26 September 2010. ^ The SCMaglev MLX01 for instance uses a trench-like track. ^ "High-Tech for 'Flying on the Ground'" (PDF). Transrapid International. Retrieved 28 December 2014. ^ "Hong Kong Physics World – Maglev". Hong Kong Physics World. Retrieved 28 December 2014. ^ R. Goodall (September 1985). "The theory of electromagnetic levitation". Physics in Technology. 16 (5): 207–213. doi:10.1088/0305-4624/16/5/I02. ^ a b c d e "Maglev: How they're Getting Trains off the Ground", Popular Science, December 1973 p. 135. ^ a b c "Principle of Maglev". Railway Technical Research Institute. Retrieved 25 May 2012. ^ a b "Study of Japanese Electrodynamic-Suspension Maglev Systems". Osti.gov. 31 August 2012. doi:10.2172/10150166. Retrieved 4 November 2012. ^ Ireson, Nelson (14 November 2008). "Dutch university working on affordable electromagnetic suspension". MotorAuthority.com. ^ Ogawa, Keisuke (30 October 2006). "Hitachi Exhibits Electromagnetic Suspension System". techon.nikkeibp.co.jp. ^ Marc T. Thompson; Richard D. Thornton (May 1999). "Flux-Canceling Electrodynamic Maglev Suspension: Part II Test Results and Scaling Laws" (PDF). IEEE Transactions on Magnetics. 35 (3). doi:10.1109/20.764894. ^ Cotsalas, Valarie (4 June 2000). "It Floats! It Speeds! It's a Train!". New York Times. ^ "A New Approach for Magnetically Levitating Trains – and Rockets". llnl.gov. Retrieved 7 September 2009. ^ Richard F. Post (January 2000). "MagLev: A New Approach". Scientific American. Archived from the original on 9 March 2005. ^ Gibbs, Philip & Geim, Andre. "Is Magnetic Levitation Possible?". High Field Magnet Laboratory. Archived from the original on 30 May 2007. Retrieved 8 September 2009. ^ "How maglev works: Learning to levitate". Maglev 2000. Retrieved 7 September 2009. ^ "Trans-Atlantic MagLev". Retrieved 1 September 2009. ^ "The Very High Speed Transit System". RAND. Retrieved 29 September 2011. ^ "Beijing Maglev". Maglev.net. Retrieved 4 November 2012. ^ "Can magnetically levitating trains run at 3,000 km/h?". ^ a b c "-Maglev Technology Explained". North American Maglev Transport Institute. 1 January 2011. Archived from the original on 27 July 2011. ^ "Transrapid claims to use a quarter less power at 200 km/h than the InterCityExpress". Transrapid. Archived from the original on 22 July 2009. Retrieved 7 September 2009. ^ "Tagungsband.doc" (PDF). Archived from the original (PDF) on 2 October 2011. Retrieved 29 September 2011. ^ a b Alan Kandel (22 November 2011). "Conventional High-Speed Rail Vs. Magnetically Levitated Trains: Was Maglev Ever In Contention?". ^ Vos, Joos (April 2004). "Annoyance caused by the sounds of a magnetic levitation train". The Journal of the Acoustical Society of America. 115 (4): 1597–1608. doi:10.1121/1.1650330. Retrieved 23 May 2008. ^ Gharabegian, Areq (November 2000). "Maglev—A super fast train". The Journal of the Acoustical Society of America. 108 (5): 2527. doi:10.1121/1.4743350. Retrieved 23 May 2008. ^ "Maglevs in Action". North American Maglev Transport Institute. 1 January 2011. Archived from the original on 27 July 2011. ^ Antlauf, Walter; Bernardeau, François; Coates, Kevin (November 2004). "Fast Track". Civil Engineering Magazine. Archived from the original on 8 May 2006. Retrieved 22 December 2017. ^ "Modular Guideway Manufacturing " North American Maglev Transport Institute". Namti.org. Archived from the original on 19 September 2011. Retrieved 29 September 2011. ^ "Report to Congress: Costs and Benefits of Magnetic Levitation (PDF)". Federal Railway Administration. US Department of Transportation. ^ "Baltimore-Washington Maglev – Environmental impact statement" (PDF). Baltimore-Washington Maglev. Archived from the original (PDF) on 26 March 2009. Retrieved 8 September 2009. ^ Nagoya builds Maglev Metro Archived 29 January 2007 at the Wayback Machine, International Railway Journal, May 2004. ^ pattont (30 January 2011). "Cost Data – HSM vs. Existing Modes " North American Maglev Transport Institute". Namti.org. Archived from the original on 19 September 2011. Retrieved 29 September 2011. ^ a b c d "Japan's maglev train breaks world speed record with 600 km/h test run". The Guardian. United Kingdom: Guardian News and Media Limited. 21 April 2015. Retrieved 21 April 2015. ^ "TGV's 357Mph Demo Proves HSM's Superiority " North American Maglev Transport Institute". Namti.org. Archived from the original on 11 December 2015. Retrieved 29 September 2011. ^ "Piloted maglev breaks world speed record". The Japan Times. The Japan Times Ltd. Retrieved 11 December 2014. ^ "The Superconducting Maglev Sets a Guinness World Record for Attaining 581 km/h in a Manned Test Run". Central Japan Railway Company. 1 March 2004. Archived from the original on 25 June 2009. ^ Barrow, Keith (17 April 2015). "Japan breaks maglev speed record". IRJ. Retrieved 20 July 2016. ^ a b "Freight maglev on test". Railway Gazette International. 9 February 2009. Archived from the original on 20 May 2010. ^ "Central Japan Railway Company Data Book 2011" (PDF). Central Japan Railway Company. p. 24. Retrieved 25 May 2012. ^ "Japan's maglev train sets speed record". CTVglobemedia Publishing Inc. 2 December 2003. Archived from the original on 6 December 2003. Retrieved 16 February 2009. ^ "Overview of Maglev R&D". ailway Technical Research Institute. Archived from the original on 5 March 2009. Retrieved 2 November 2009. ^ "BBC – Homepage". bbc.com. ^ "IEEE Transactions on Applied Superconductivity, VOL. 19, NO. 3, page 2142 JUNE 2009". Ieeexplore.ieee.org. 17 July 2009. doi:10.1109/TASC.2009.2018110. Retrieved 29 September 2011. ^ "Patent US 20150040791 A1". ^ Michael, Gebicki (27 November 2014). "What's the world's fastest passenger train". Stuff.co.nz. Retrieved 24 December 2014. ^ Sommerville, Quentin (14 January 2008). "Asia-Pacific | Well-heeled protests hit Shanghai". BBC News. Retrieved 4 November 2012. ^ "Shanghai Maglev Train (431 km/h) – High Definition Video". shanghaichina.ca. ^ "Nagoya builds Maglev Metro". International Railway Journal. May 2004. Archived from the original on 29 January 2007. ^ "S. Korea unveils first domestically-developed urban maglev train". Global Times. Xinhua. 16 May 2014. Retrieved 9 January 2015. ^ "Incheon Airport maglev unveiled". Railway Gazette. 20 May 2014. Retrieved 9 January 2015. ^ "Musharraf's Relative Lands Another Super Duper Project of the Future". The South Asia Tribune. 12 May 2005. Archived from the original on 16 January 2008. Retrieved 27 October 2008. ^ "Urban maglev opportunity". Railway Gazette International. 5 September 2008. Retrieved 27 October 2008. ^ a b "Rotem Business Activities, Maglev". Rotem-Hyundai. 27 October 2008. Retrieved 27 October 2008. ^ "Korea launches maglev train". Korea.net. 21 April 2008. Archived from the original on 25 July 2009. Retrieved 27 October 2008. ^ "First run of the Maglev". Hankyoreh. 21 April 2008. Retrieved 27 October 2008. ^ "Maglev train simulation hits the tracks". Scientific Computing World. 20 August 2008. Retrieved 27 October 2008. ^ "Exports surge ahead". International Railway Journal. 1 July 2008. Retrieved 27 October 2008. ^ "Changsha Maglev Line Completes Investment over 490 Million Yuan". Retrieved 29 December 2014. ^ Long, Hongtao (6 May 2016). "Trial operation of magnetic levitation line in Changsha to start". People's Daily Online. Retrieved 6 May 2016. ^ "CRRC unit delivers 160 km/h maglev train for commuters". Retrieved 23 July 2018. ^ "American Maglev Technology (AMT) Assessment" (PDF). 5 June 2013. Archived from the original (PDF) on 19 March 2014. ^ "JR Tokai begins building maglev stations". The Japan Times. Retrieved 2 January 2015. ^ "JR Tokai gives maglev estimates to LDP; in favor of shortest route". The Japan Times. 19 June 2009. Archived from the original on 12 July 2009. Retrieved 8 July 2009. ^ "25 Tokyo-Nagoya maglev debut eyed". The Japan Times. 27 April 2007. Archived from the original on 29 September 2007. Retrieved 27 April 2007. ^ "Go Ahead for Japanese Maglev". Maglev.net. Retrieved 28 June 2011. ^ ＪＲ東海：リニア時速500キロ、試験再開－通勤圏拡大で激変も [JR Central: Maglev testing at 500 km/h resumes – Expanded commuter area to create major upheavals]. Bloomberg (in Japanese). Japan: Bloomberg LP. 29 August 2013. Retrieved 12 February 2015. ^ "JR Tokai unveils a model for the new high-speed maglev train 'L0′". Daily Onigiri. DailyOnigiri.com. 4 November 2010. Retrieved 17 January 2013. ^ Wakefield, Jane (24 June 2014). "Sky cars to be built in Tel Aviv". BBC News. Retrieved 8 January 2015. ^ "NASA's SkyTran personal maglev transport to trial in Israel". Stuff. 3 July 2014. Retrieved 8 January 2015. ^ Baker, James. "They are building the first personal maglev transport system in Israel". Spoid. Retrieved 8 January 2015. ^ "SkyTran to Build Futuristic Maglev 'Hover Monorail' in Israel". Inhabitat. 27 June 2014. Retrieved 8 January 2015. ^ "Hover cars have arrived! Self-driving sky pods set to soar above traffic on high-speed magnetic tracks". MailOnline. 27 June 2014. Retrieved 8 January 2015. ^ Vantuono, William (1 July 1994). "Maglev is ready. Are we?". Railway Age. ^ Christodoulou, Mario (2 August 2008). "Maglev train reappears on agenda". Illawara Mercury. ^ Watters, Martin (30 July 2008). "Plans to build Geelong-Melbourne-Frankston monorail". Herald Sun. Australia. ^ "Melbourne Concepts – Maglev's relevance". Windana Research. Archived from the original on 12 May 2013. Retrieved 7 September 2009. ^ "L'EIR propone un "Maglev lombardo" per Milano Expo". movisol.org. ^ Mar.Lar. 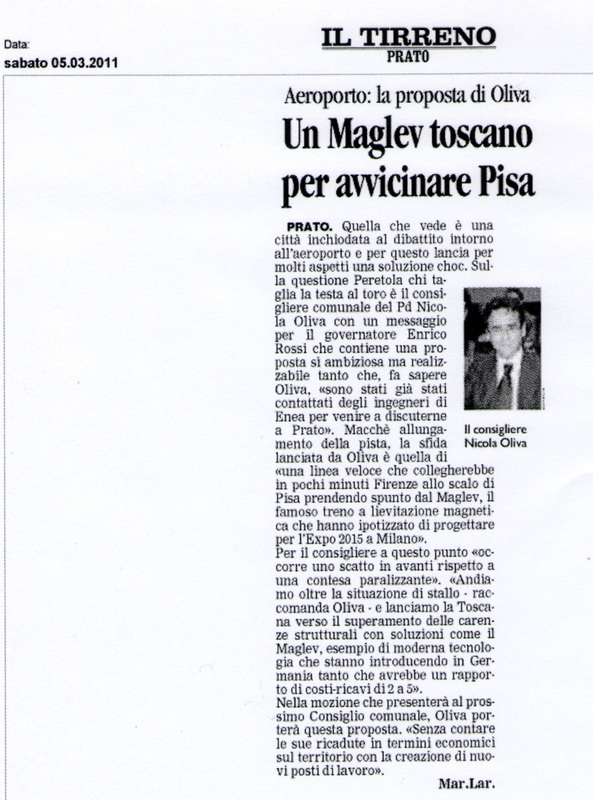 "Un Maglev toscano per avvicinare Pisa". il Tirreno. ^ "Prato chiede il Maglev per la Toscana". ^ "Factbook" (PDF). 500kmh. October 2007. Retrieved 13 December 2012. ^ "Shanghai-style Maglev train may fly on London line". China View. 7 June 2005. Archived from the original on 16 June 2009. ^ "Government's five-year plan". Railway Magazine. Vol. 153 no. 1277. September 2007. pp. 6–7. ^ "UK Ultraspeed". Retrieved 23 May 2008. ^ Wainwright, Martin (9 August 2005). "Hovertrain to cut London-Glasgow time to two hours". The Guardian. UK. Retrieved 23 May 2008. ^ Blitz, James (31 August 2006). "Japan inspires Tories' land of rising green tax". Financial Times. Retrieved 23 May 2008. ^ Persch, Jasmin Aline (25 June 2008). "America's fastest train moves ahead". msnbc. Retrieved 31 July 2008. ^ "Maglev Route". Archived from the original on 14 May 2013. Retrieved 1 July 2006. ^ "The Pennsylvania Project". Retrieved 25 September 2007. ^ "SANDAG: San Diego Maglev project". Retrieved 23 May 2008. ^ "Orlando MagLev Plan Gets Tentative Approval". WYNC. 17 December 2012. ^ "American Maglev Technology (AMT) Assessment Phase I: Data Collection, Data Development, Meetings and Recommendations" (PDF). December 2011. ^ "Marietta Company Ready to Send Maglev Technology Abroad". Globalatlanta.com. Retrieved 29 September 2011. ^ "William Miranda Torres pide apoyo para financiar tren en Caguas". Primerahora.com. Retrieved 29 September 2011. ^ casiano communications (19 May 2011). "Inteco looks at 'maglev' train system". caribbeanbusiness.pr. Archived from the original on 6 April 2012. Retrieved 29 September 2011. ^ "Toronto Zoo meglev train floats closer to reality as board approves proposal". Toronto Star. 29 November 2018. ^ "Germany to build maglev railway". BBC News. 25 September 2007. ^ Heller, Gernot (27 March 2008). "Germany scraps Munich Transrapid as cost spirals". Reuters. ^ "Lausanne en 10 minutes" (PDF) (in French). GHI. 3 March 2011. Retrieved 20 May 2011. ^ "In 20 Minuten von Zürich nach Bern" (PDF) (in German). Neue Zürcher Zeitung. 20 June 2009. Retrieved 20 May 2011. ^ "Swissmetro.ch". Swissmetro.ch. Retrieved 29 September 2011. ^ McGrath, Dermot (20 January 2003). "China Awaits High-Speed 'Maglev'". Wired. ^ "China maglev project suspended amid radiation concerns". Xinhua. 26 May 2007. Archived from the original on 4 November 2012. ^ "Hundreds protest Shanghai maglev rail extension". Reuters. 12 January 2008. ^ Kurtenbach, Elaine (14 January 2008). "Shanghai Residents Protest Maglev Train". Fox News. Archived from the original on 13 September 2009. ^ "Maglev railway to link Hangzhou, Shanghai". Xinhua. 6 April 2006. ^ "Maglev finally given approval". Shanghai Daily. 18 August 2008. ^ "Green light for maglev factory". Shanghai Daily. 22 November 2007. ^ "China claims train blue riband". Retrieved 27 December 2014. ^ "Shanghai welcomes high speed train". CNN business. Retrieved 27 December 2014. ^ "Mumbai to Delhi: 3 hours by train". Express India. 14 June 2005. ^ "6 routes identified for MagLev". Times of India. India. 22 June 2007. ^ "Bullet train may connect Mysore-Bangalore in 1hr 30 mins Photos". Yahoo! India Finance. 20 April 2012. Retrieved 4 November 2012. ^ "At what cost high-speed rail". thesundaily.my. ^ "No Operation". Presstv.ir. Archived from the original on 21 May 2011. Retrieved 29 September 2011. ^ "UPDATE 2-ThyssenKrupp, Siemens unaware of Iran train deal". News.alibaba.com. 30 May 2009. Retrieved 29 September 2011. ^ Vranich, Joseph (1 May 1992). "High speed hopes soar". Railway Age. ^ "Several Dead in Transrapid Accident". Spiegel Online. 22 September 2006. ^ "23 dead in German maglev train accident". M&C Europe. 22 September 2006. Archived from the original on 11 October 2007. ^ "German prosecutor charges three Transrapid employees over year-old disaster". AFX News. 30 September 2007. Archived from the original on 4 June 2011. Heller, Arnie (June 1998). "A New Approach for Magnetically Levitating Trains—and Rockets". Science & Technology Review. Henry H. Kolm; Richard D. Thornton (October 1973). "Electromagnetic Flight". Scientific American. Springer Nature. 229 (4): 17–25. Rossberg, Ralf Roman (1983). Radlos in die Zukunft? Die Entwicklung neuer Bahnsysteme. Orell Füssli Verlag. ASIN B002ROWD5M. Rossberg, Ralf Roman (1993). Radlos in die Zukunft? Die Entwicklung neuer Bahnsysteme. Orell Fuessli Verlag. ISBN 978-3-280-01503-2. Wikimedia Commons has media related to Magnetic levitation trains. Look up maglev in Wiktionary, the free dictionary. The International Maglev Board Maglev professionals' info plattform for all maglev transport systems and related technologies.